Ask fellow campers about "Greenbrier State Park" and nearby attractions. This is a very nice park. Everything was clean and well cared for. Our gravel site was level and had been raked before we got there. We did some hiking while we were there, and the hiking trails were well tended. A couple of the loops don't allow pets, so be aware of that before you come with pets. We camped at Greenbrier State Park in a Motorhome. A number of very nice hiking trails in the park. We stayed in the Cedar Electric loop. This park is very well designed for camping. All sites are reasonably level, but some have fairly steep slopes to the pad. The campground host was very informative and kept the sites spotless. We will definitely return. We camped at Greenbrier State Park in a Travel Trailer. There is a small lake here that you can swim, fish, and boat (paddle or electric motor only). There are several hiking trails and access to the Appalachian Trail is nearby . Hagarstown and Frederick are both good sized towns with a 30 minute drive. We had good pizza in Boonsboro. Very close to Washington Monument State Park, Gathland State Park and Antietam National Cemetary/Battlefield. This was our second time camping here, both times in late April, so crowds were minimal. The sites we saw were all freshly raked and smooth. With a little planning you can find a site that offers privacy against a wooded hillside. The Park staff has been very friendly and helpful during both of our stays here. Nice hiking trail from the camping loops down to and around the Park's lake. We will certainly return. We camped at Greenbrier State Park in a Travel Trailer. In my view, Fall is the best time to visit this little gem, a time when the crowds of summer are gone, the foliage along the well-marked and quite diverse trails is magnificent, and pets are allowed to romp in the beach area. This park is one of our family's nostalgic favorites and provided our children with a foundation for a love of camping. The facilities are well maintained, the many trails offer varying levels of difficulty and include access to the Appalachian Trail, and the ranger-naturalist programs are interesting and well attended. If only they would bring back the Saturday evening ice cream socials, which were discontinued last year... We camped at Greenbrier State Park in a Tent. The park is easy to access from main roads and interstate but far enough back that the only "road noise" is a racetrack/drag strip that is near-by. As you enter the park, there is a convenient park station that you have to pass to check-in; parking lot can easily accommodate 4-5 large RVs plus vehicles. Campground has limited access with gate and keypad; it is fairly narrow and oversized RVs may be challenged. Dump station is on left as you access to fill up with water since only electric is available. Sites are then easy to access with well maintained, paved roads. There are 3-4 ring-roads that are alphabetical but named (Ash, Birch, Cedar, etc). Sites are easy to access although different sizes. Most are on the side of the sloped hill and at different elevations. All have covered by trees and many large rigs came in. Some sites have sloped driveways although the sites are fairly level (ours required 2 blocks on the right side that you couldn't tell by looking at it). Very quiet. Bath houses are centrally located but we did not use. Water points are throughout the ring road. Ring roads are curvy and long travel trailers would need to go slow; 35 and below probably no problems (at least on Cedar). We stayed in a 25' Travel Trailer. We camped at Greenbrier State Park in a Travel Trailer. 1 hour to Gettysburg National Battlefield, 15 minutes to Antietam National Battlefield, 30 minutes to Harper's Ferry. Campground has a great lake and a very large beach and play ground (not located near the campground; about 5 minute drive). Beach visitors would need code to access campground side. Site was partially shaded, more private than many others in the loop, but still not very secluded. Nice and level. Hardly any space between sites. Definitely the tightest MD state park we've camped at by far. Luckily, we were there during the week, so it was not crowded at all, and reasonably quiet. Had we been there on a weekend, I can only imagine that the crowds and noise would have driven me crazy. Facilities/Overall Park: Bath house was fine; very average as far as bugs and cleanliness. Only 2 or 3 shower stalls, IIRC; never a wait while we were there, but I imagine the lines are long on weekends. There was a relatively easy hiking trail from the campground down around the lake, with some nice, quiet little spots for fishing. To get to the sandy beach area of the lake, we drove, since we had 3 kids and a ton of crap to transport. The lake area is very nice, with tons of picnic spots in the shade. However, every single picnic table was in use, and the beach was pretty crowded, and we were there on a Wednesday! I can only imagine how packed it would be on a weekend. Despite the moderate crowds, we really enjoyed ourselves, and I think I liked it even better than the lake area at Cunningham Falls. We camped at Greenbrier State Park in a Tent Trailer. We didn't venture outside the park, but there seems to be plenty to do in the area. Greenbrier is part of South Mountain Recreation Area, which includes a few other state forests, historic battlefield area, and even parts of the Appalachian Trail. Hagerstown and Frederick are also a short drive away, and both have everything you could want as far as restaurants, shopping, etc. are concerned. Great state owned campgrouond. Easy to get to from the Interstate. We stayed in Cedar Loop which is the only loop with electric. All back in sites. No water hook ups, no over the air TV. The best part about camping here were the campground's hosts who were parked next to us. They quickly solved an issue with another camper who was in our assigned site. Then they helped us with good suggestions on avoiding the beltway around Washington, DC. Lastly, they came over with freshly baked banana chocolate chip muffins! We would definitely stay here again. We camped at Greenbrier State Park in a Travel Trailer. There are two areas: a day use lake, picnic area and a camping area. The camping area has 4 loops, only one loop has power (Cedar Loop), this loop is the best geared to RV camping, a big portion of the other loops are for small units and tents. This is not a big rig friendly park. Few sites will accept big rigs. It is clean and well run. Cell service is good TV antenna service is fair. Satellite service is spotty, hour in the mountains. Overall a nice park. We were hosts here for 3 months; hosts have full hookups. We were in a 42' rig. We camped at Greenbrier State Park in a Fifth Wheel. Lots of history in this area, some great shopping within 15 miles. Talk about camping in the wild! This park is literally in the middle of nowhere. No Wi-Fi, no cable, no water, no sewer...just electricity. Still it was a pleasant change of pace and very quiet. 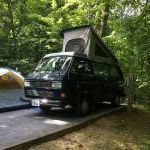 We camped at Greenbrier State Park in a Motorhome. Very nice park with a lake. All the personal were helpful and friendly. Good hot showers. We were in Cedar loop 7, which was fine for our 28 ft travel trailer. Other site I would recommend would be 27. Both do not have any other site close to them and were near the bath house. Camping loops were well patrolled by the rangers. There is a beach in the park for swimming in the lake that is very nice. We camped at Greenbrier State Park in a Travel Trailer. Hagerstown about 9 miles away with plenty of stores. Harpers Ferry about 30 minutes. C&O bike trail about 20 minutes away. Going through Sharpsburg a must stop is Nutter's ice cream store, good ice cream and plenty of it at an amazing price; they only accept cash. Good trout fishing 2 miles away from the park at Beaver creek. Fly fishing shop right there to help. We really like this campground and try to camp there a couple of times a year. Small lake, lots of trees and trails, 30 amp service and a dump station. We camped at Greenbrier State Park in a Tent Trailer. Great lake, lots of hiking trails. A really nice park. Lots, while without water are shaded but can be challenging to back into (most uphill and require a turn). Restrooms/ showers can be a hike if you don't get close. Lots are nicely leveled. Kids play area and swim area are not withing walking distance of the camping area, necessitating a drive around to the area. We camped at Greenbrier State Park in a Fifth Wheel. Maryland has one of the nicest State Park systems on the East Coast and Greenbrier is not an exception. We arrived to a friendly greeting from the campground hosts, a clean, level, groomed site, and great access roads. The bathrooms were very clean and easily accessible and the park is right off Route 40 just a short drive to Hagerstown or Frederick. One thing to be careful of is that the front gate gets locked at 10:00pm (at least in April) and not unlocked until 8:00am. If you have to go somewhere make sure you can handle opening the gate yourself. It is a substantial gate though it swings easily once the lock is undone. Just leave yourself some extra time in the morning. We camped at Greenbrier State Park in a Motorhome. This is a beautiful state park. The sites, while gravel and some not completely level for a long-rig, they are more than adequate with clean and raked "patio" areas. While the sites are heavily treed, they posed no problem for us, even tough we require a 12'8" clearance. Over-the-are television reception was a bit spotty but cell reception excellent. We would definitely stay here again! We camped at Greenbrier State Park in a Motorhome. Nightly rate reflects senior discount. A wonderful campground.Well maintained and layer out. 90 percent are wooded sites. A well defined level parking spot with about a 100 ft between campers. Our cellphone worked and we found several local TV stations with the antenna. The location was great near I-70 on Rt 40 between Hagarstown and Fredrick Md. A short drive to Antietam battlefield and Harpers Ferry. A great spot for exploring the area. A 10 in my book We camped at Greenbrier State Park in a Travel Trailer. Are you affiliated with Greenbrier State Park ?